Dance Mogul: What inspired you to pursue wrestling? Dance Mogul: What were some of the obstacles you faced pursuing your passion? Ron: The biggest obstacle I faced was “myself” as it related to change. Being a black man with not so good of a past life, I made many mistakes. I had tunnel vision and only thought one way that was beneficial to me. Basically, I was close minded and had a one track mind. There are obstacles throughout life and unfortunately a lot of times we are the originators of our own obstacles. Dance Mogul: Was it hard to dream big being from the South? Ron:I would have to say yes and no to that question.NO it wasn’t hard dreaming big from the south, because wrestling had just been introduced to the south by The Crockets, meaning National Wrestling Alliance (NWA) professional wrestling. The dream was a visual proof of reality that it COULD happen. On the other hand, YES it was hard to dream big being from the south as a black man, seeing that there were very few blacks in professional wrestling on a high super stardom level. Dance Mogul: When did you get your big break in wrestling? Ron: I received my first big break in professional wrestling in 1998 as I was working in Georgia for a company called NWA Wild Side. I had pretty much made a name for myself on the independent circuit. One of my co-workers, by the name of Rick Michaels asked me why I had not submitted any of my matches on tape to the WWF. I didn’t have any. He asked his father whom filmed all the wrestling events, to also film my wrestling matches. The tape was made, sent in for review, and much to my surprise, I received a response within two weeks. I was flown to the WWF headquarters in Stamford, Connecticut and within the next couple days I had a binding contract with the organization. From that moment on my faith and belief had multiplied. Dream and set goals because I am a witness that with focus and determination they do come true. Dance Mogul: As a professional of color how important is it for the fans to see you as a winner in the wrestling culture? Ron: As a professional wrestler of color, it is very important for fans to see me as a winner in the culture of wrestling. This will let not only Afro-Americans, but other minorities know that with set goals, heart and fortitude, they can take opportunities, make the change, break through the obstacles and become winners and champions as well. Dance Mogul: Tell us how you hope to use your notoriety to help create entrepreneurship? 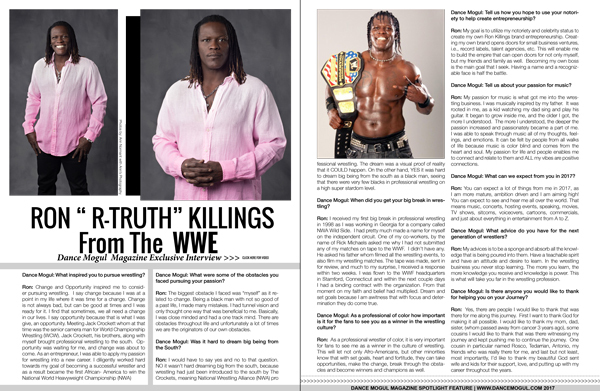 Ron: My goal is to utilize my notoriety and celebrity status to create my own Ron Killings brand entrepreneurship. Creating my own brand opens doors for small business ventures, i.e., record labels, talent agencies, etc. This will enable me to build the empire that can open doors for not only myself, but my friends and family as well. Becoming my own boss is the main goal that I seek. Having a name and a recognizable face is half the battle. Dance Mogul: Tell us about your passion for music? Ron: My passion for music is what got me into the wrestling business. I was musically inspired by my father. It was rooted in me, as a kid watching my dad sing and play his guitar. It began to grow inside me, and the older I got, the more I understood. The more I understood, the deeper the passion increased and passionately became a part of me. I was able to speak through music all of my thoughts, feelings, and emotions. It can be felt by people from all walks of life because music is color blind and comes from the heart and soul. My passion for life and people enables me to connect and relate to them and ALL my vibes are positive connections. Dance Mogul: What can we expect from you in 2017? You can expect a lot of things from me in 2017, as I am more mature, ambition driven and I am aiming high! You can expect to see and hear me all over the world. That means music, concerts, hosting events, speaking, movies, TV shows, sitcoms, voiceovers, cartoons, commercials, and just about everything in entertainment from A to Z. Dance Mogul: What advice do you have for the next generation of wrestlers? Ron: My advices is to be a sponge and absorb all the knowledge that is being poured into them. Have a teachable spirit and have an attitude and desire to learn. In the wrestling business you never stop learning. The more you learn, the more knowledge you receive and knowledge is power. This is what will take you far in the wrestling profession. Ron: Yes, there are people I would like to thank that was there for me along this journey. First I want to thank God for making it all possible. I would like to thank my mom, dad, sister, (whom passed away from cancer 3 years ago), some cousins I would like to thank that was there witnessing my journey and kept pushing me to continue the journey. One cousin in particular named Rosco, Tedarrian, Antonio, my friends who was really there for me, and last but not least, most importantly, I’d like to thank my beautiful God sent wife and kids for their support, love, and putting up with my career throughout the years.